DETROIT -- When auto sales in China fell last month, General Motors' share price took a hit, reflecting investor fears that the automaker would abandon promises to deliver strong profit margins from its operations in the world’s biggest car market. 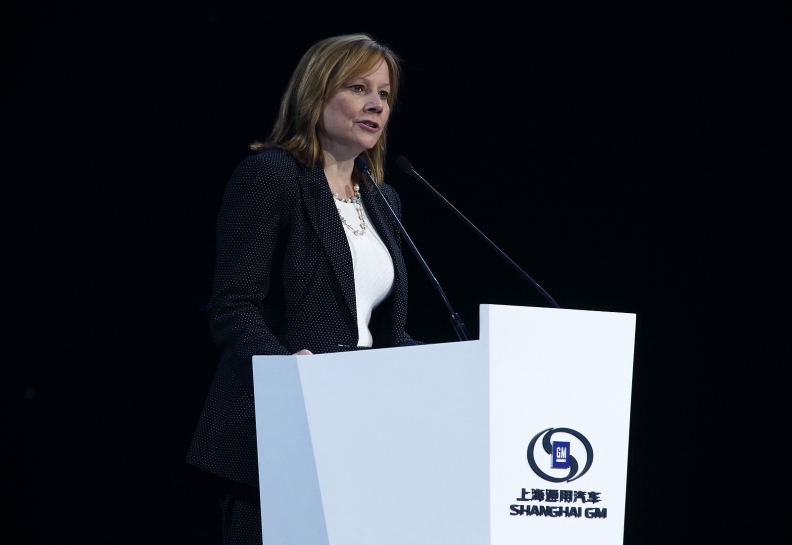 GM Chief Executive Mary Barra, however, had been pushing her executive team in China since the first signs of trouble in the market early this year to find ways to hit the company’s target of delivering 9 to 10 percent profit margins, despite falling car prices and weak economic growth. The answers, she said, included cutting costs for materials used in GM’s Chinese models and building more higher-priced SUVs with the company’s Chinese partners. On Thursday, GM reported second-quarter results that beat Wall Street’s expectations in part because of earnings from China that confounded expectations of weakness. The company said its share of profits from its ventures in China was flat with a year ago at about $500 million, while margins rose to 10.2 percent from 10 percent a year ago. GM stuck to a forecast of generating about $2 billion in profits from China this year, despite warning that vehicle prices in China could decline about 5 to 6 percent. The pre-bankruptcy GM often backed away from ambitious profit targets during market slowdowns. Now, Barra said, GM executives take a different approach. GM Chief Financial Officer Chuck Stevens delivered the same message Thursday to reporters and employees. “There are a lot of levers we can pull” to cut costs, he said. Long term, Stevens said, China will grow to annual vehicle sales of 35 million, up from about 20 million now. GM’s strong second-quarter results gave a boost to both the automaker’s stock and to Barra, but she did not declare victory. GM shares closed Thursday at $31.50, still below their $33 a share post-bankruptcy initial offering price. “People will be skeptical about it for a while,” said Matthew Stover, analyst with Susquehanna Financial Group Stover. Barra said GM has much work left to establish a better reputation with investors. “What we did today we have to do the next quarter and the quarter after that,” she said. Barra’s nearly 19 months at the helm of the largest U.S. automaker have been a rollercoaster ride. The celebration of her historic breakthrough as the first woman to run a global automaker was cut short by a scandal over long-delayed safety recalls that consumed most of 2014. Earlier this year, Barra agreed to give $10 billion back to shareholders to avert a battle with a shareholder group unhappy with the automaker’s cash hoarding. She then fended off an unwelcome merger overture from Fiat Chrysler Automobiles NV Chief Executive Sergio Marchionne. Investors got a reminder Thursday that it will not be easy for GM to steer away from its troubled past. The automaker disclosed that the Federal Trade Commission is investigating whether dealers had certified making repairs to used cars but left undone fixes required under safety recalls. GM also added about $75 million to a fund to pay victims of accidents linked to defective ignition switches, bringing the total allocated to that fund to $625 million -- enough to pay for an extensive facelift for one of GM’s vehicles.